Not to be confused with its tiny, two-seat namesake from the 1960s, the 2+2 Elite even today offers a low-cost route to Lotus ownership. The shape when replacing the Elan+2 in 1974 came as quite a shock to fans of the brand. However the world was in crisis and traditional sports cars under threat. 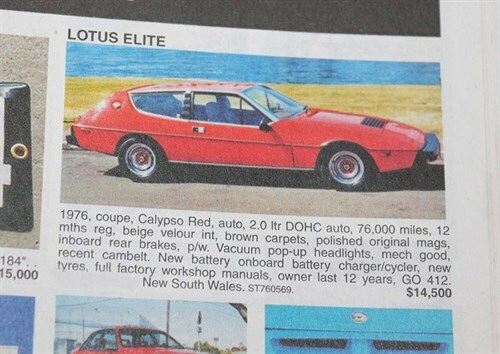 Lotus saw the wagon-like Elite and later Excel as protection against rapacious legislators and to a degree they were right. About 2500 were made, but only a quarter went to North America and a few for Australia. Reasonable cars for sale in USA remain cheap, however anything really outstanding will be hard to find. Values during the past decade have hardly moved. 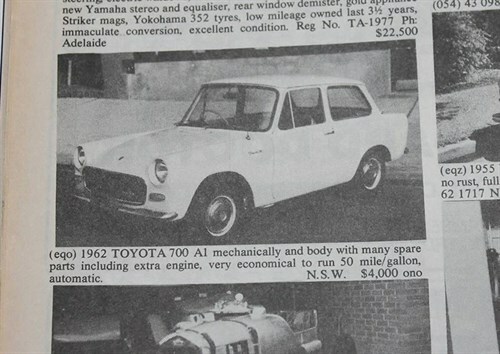 A little while back this magazine featured a lovely example of Toyota’s pioneering 700. When sold in other places these diminutive cars carried ‘Publica’ badges, however that might have sounded a mite subversive in a land ruled by HM and Bob Menzies. The 700 was well-equipped but its two-speed auto transmission was a weak point and a lot of otherwise tidy Toyotas went to the crusher due to failures in the Toyoglide department. Asking $4000 ranked in 1988 as borderline insanity but it should have managed $1500-2000 and grown from there. Despite its status as the earliest of MG’s popular T Series, the TA generates no more interest and marginally less money than the post WW2 TC. Around 3000 TAs were built during three years of production and a couple of cars, including a green one visually very similar to this, have been offered locally for auction during recent years. Neither was able to break the $40,000 barrier and that situation has been echoed overseas where auctioneers struggle to reach estimates. 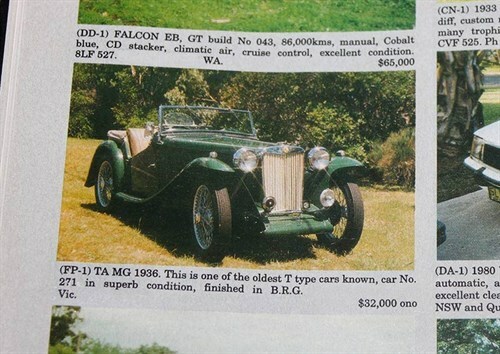 An unrestored TA with the later XPAG engine recently went unsold at US$15,000.